Russell is a Partner and Head of Glaisyers' Employment Team. Russell has practised exclusively in the field of employment law since qualifying as a solicitor in 2000. 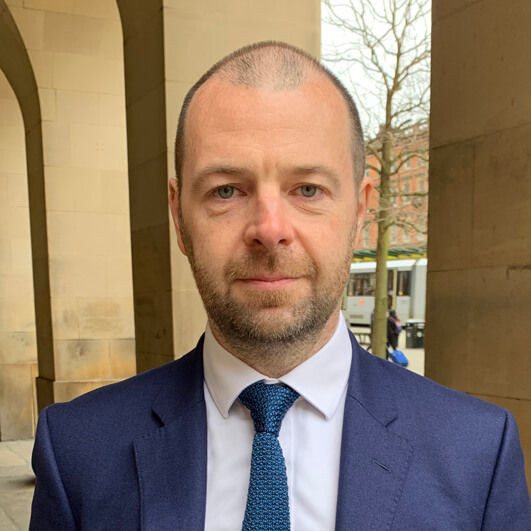 He acts for individuals and organisations on a wide range of matters across the entire field of employment law including; Employment Tribunal and High Court litigation relating to; unfair dismissal, discrimination, whistleblowing and breach of contract claims. He also regularly advises clients on routine matters such as; disciplinary and grievance handling, absence and performance management, family friendly rights, protected conversations, negotiating the terms of settlement agreements, redundancy and restructuring as well as more complex areas such as privacy rights, GDPR, TUPE, confidentiality, bonus/contract disputes and the enforcement of restrictive covenants. He also frequently drafts employment contracts, directors’ service agreements, settlement agreements, consultancy agreements and employee handbooks. He is also a member of the Employment Law Association. He regularly speaks on the subject of employment law to various professional bodies, groups and trade associations and has appeared on Sky News and BBC news as a commentator on employment law related issues in the media. He also regularly writes articles and blogs which have been published in People Management and other HR related media. Russell is known for being easy to work with and his ability to provide commercial and pragmatic advice. He has developed many long term working relationships with a number of clients across a wide range of sectors including; construction, education, engineering, fashion, health, hotel/hospitality, insurance, manufacturing, media, property, professional services, retail, sport and transport. Outside of work, Russell’s spare time is spent with his wife and children, watching his sons play rugby and football and participating in triathlon events.